Because routine ear examinations with traditional handheld otoscopes do not light the ear canal well, or allow for clear visibility deep into the ear canal, many pet ear problems and chronic conditions often go undiagnosed and untreated. With powerful tools like the Storz HD Video Otoscope, Dr. Kureshi is able to see a bright, clear image of what's going on deep inside the ear canal. This provides our patients with a more accurate diagnosis and better treatment for inner ear problems. Since 1998, Dr. Kureshi has provided his patients with the most advanced technology to more accurately diagnose and provide effective treatment for chronic and general pet ear problems. We are proud to announce the opening of our new clinic. Frustrated with Chronic Pet Ear Problems? Schedule a Consult with Us! Chronic ear problems and chronic ear infections can cause an inflammation of the external auditory canal and can cause great discomfort to your pets. A routine ear examination using a handheld otoscope could miss easily treatable problems. By using our in-clinic veterinary video otoscope, we are able to provide better and more accurate treatment. An instrument for examining the external canal and tympanic membrane of the ear. A photo of what can typically be seen with an HD video otoscope is pictured to the right. What Is The Storz HD Video Otoscope And What Can You Do With It? The Storz HD Video Otoscope is powerful tool in aggressively treating chronic animal ear infections and other ear problems. It has a built in camera and a powerful, bright light. It connects to a video system that allows us to capture, view, and record images at a magnification of 15x. This not only means we can see better, brighter images at a much larger magnification, but when combined with an endoscope, we can treat problems that might lie even further in the ear. 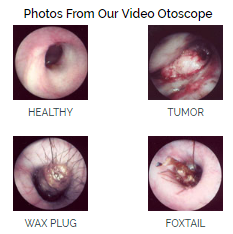 We can even send tools through the video otoscope, including our state-of-the-art laser, to biopsy, remove and/or treat problems. What Does This Mean For My Pets? We can more accurately diagnose, treat, and perform procedures with minimal invasiveness to your pet. Having the Storz HD Video Otoscope allows us to more accurately diagnose and treat inner ear problems in our patients that might otherwise go undiagnosed. To find out if the veterinary video otoscope is right for your pet, speak with our staff and learn more about this innovative technology. Clear, bright, 15x magnified images on a large screen for more accurate treatment/diagnosis. Print image of ear for review and track progress. 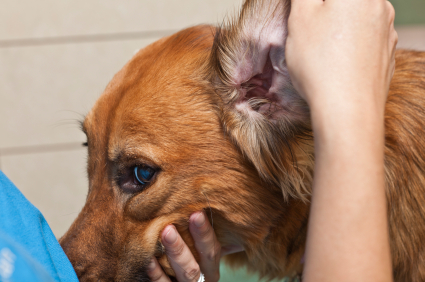 See further in the ear to diagnose and treat your pet. Send tools, like Laser, through the scope to more effectively treat, biopsy problems and diseases. And more hidden dangers and undiagnosed problems. Copyright 2007-2015. All rights reserved. All content and images are the property of Cupertino Animal Hospital unless otherwise noted. No content or material may be used from this website without permission from Cupertino Animal Hospital.